A number of FDA medication advisories have been issued in recent years as a result of increased awareness of serious side effects associated with fluoroquinolones, a class of broad-spectrum, systemic antibacterial agents that have been widely used for a number of infections, including respiratory and urinary tract infections. 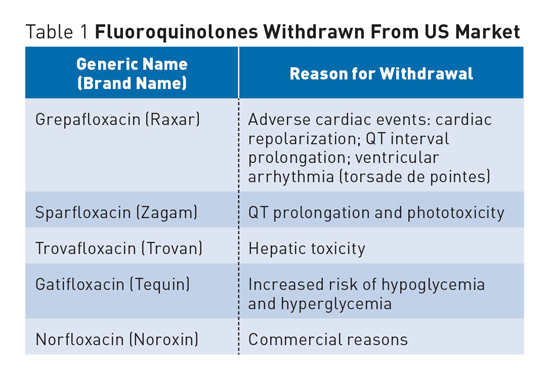 In addition to increased warnings, a number of fluoroquinolone antibiotics have been withdrawn from the US market and other countries due to various concerns (see Table 1). In May 2016, The FDA released a drug safety letter advising health care professionals that for patients with other treatment options, the risks associated with using fluoroquinolone antibiotics generally outweigh the benefits for patients with acute sinusitis, acute bronchitis, and uncomplicated urinary tract infections. 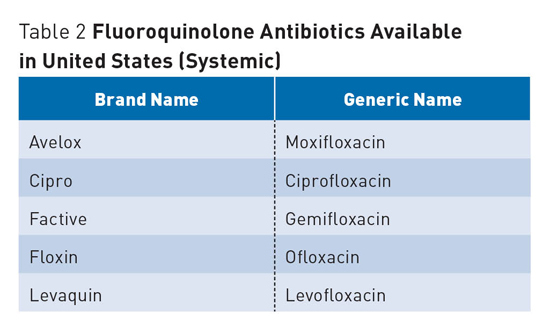 For patients with these conditions, fluoroquinolones should be reserved only for those without alternative treatment options.1,2 Many cases of acute sinusitis and acute bronchitis infections are often viral rather than bacterial, making the use of any antibiotic inappropriate. In August 2013, the FDA required the drug labels and Medication Guides for all fluoroquinolone antibacterial drugs to be updated to more fully explain the serious side effect of peripheral neuropathy, a nerve disorder of the arms or legs. Symptoms include pain, burning, tingling, numbness, weakness, or a change in sensation to light touch, pain, or temperature, or the sense of body position. The serious nerve damage potentially caused by fluoroquinolones can occur at any time during treatment with fluoroquinolones and can last for months to years after the drug is stopped. The damage could possibly become permanent. Patients developing symptoms of peripheral neuropathy should immediately inform their health care professionals. The risk of peripheral neuropathy is associated only with systemic fluoroquinolones taken by mouth or by injection. Topical formulations of fluoroquinolones, applied to the ears or eyes, are not known to be associated with this risk. In 2008, the FDA strengthened previous prescribing information and warnings about the increased risk of tendinitis and tendon rupture in patients taking fluoroquinolones, requiring manufacturers to add a Black Box warning to their labeling. Tendinitis and tendon rupture most frequently involve the Achilles; surgical repair is sometimes required. Tendinitis and tendon rupture have also been reported to occur in the shoulder (specifically, the rotator cuff), the hand, the biceps, and the thumb. Tendon rupture can occur during or after completion of fluoroquinolone use; cases have been reported to have occurred up to several months after completion of therapy. Inform patients that tendons are the areas that connect muscles to joints and that the Achilles tendon is at the back of the ankle. Health care professionals and patients should recognize pain, swelling, inflammation, and tears of tendons including the Achilles, shoulder, hand, or other tendons as possible side effects of fluoroquinolone treatment. The risk for tendon problems is higher in patients who are over the age of 60, taking steroids (corticosteroids), and who have undergone kidney, heart, or lung transplant. Other reasons for tendon ruptures and increased risk include physical activity or exercise, kidney failure, and prior tendon problems, such as with those occurring with rheumatoid arthritis. Patients receiving fluoroquinolones should notify their health care providers immediately at the first signs or symptoms of pain, swelling, or inflammation in a tendon area, and should avoid exercise and use of the affected area. The fluoroquinolone medication should be stopped until it is determined whether it results from tendinitis or a tendon rupture. • inability to move the affected area or bear weight. Appropriate dosing of fluoroquinolones is very important, with dosing adjustments varying by agent depending on their principal route of elimination. Whereas moxifloxacin is eliminated predominately by nonrenal pathways, ofloxacin and levofloxacin are eliminated predominantly by the kidneys. Most other fluoroquinolones, such as ciprofloxacin, are excreted by both renal and nonrenal routes. • no dose adjustment of moxifloxacin is necessary in the presence of renal failure. Fluoroquinolone use has the potential to cause significant harm to patients who may take these medications. These risks, along with growing concerns of antibiotic resistance and potentially inappropriate antibiotic use, further demonstrate the importance and growing need for strong antimicrobial stewardship implementation across health care settings. 1. FDA drug safety communication: FDA advises restricting fluoroquinolone antibiotic use for certain uncomplicated infections; warns about disabling side effects that can occur together. US Food and Drug Administration website. http://www.fda.gov/Drugs/DrugSafety/ucm500143.htm. Updated June 7, 2016. Accessed July 17, 2016. 2. US Food and Drug Administration. FDA drug safety communication: FDA requires label changes to warn of risk for possibly permanent nerve damage from antibacterial fluoroquinolone drugs taken by mouth or by injection. http://www.fda.gov/downloads/Drugs/DrugSafety/UCM365078.pdf. Published August 15, 2013. Accessed August 1, 2013.
ucm126085.htm. Updated August 15, 2013. Accessed August 1, 2016. 4. Johanesen PA, Mackin KE, Hutton ML, et al. Disruption of the gut microbiome: clostridium difficile infection and the threat of antibiotic resistance. Genes. 2015;6(4):1347-1360. 5. Kang J, Wang L, Chen XL, Triggle DJ, Rampe D. Interactions of a series of fluoroquinolone antibacterial drugs with the human cardiac K+ channel HERG. Mol Pharmacol. 2001;59(1):122-126. 6. QTdrugs list. CredibleMeds website. www.Crediblemeds.org. Updated August 10, 2016. 7. Etminan M, Forooghian F, Brophy JM, Bird ST, Maberley D. Oral fluoroquinolones and the risk of retinal detachment. JAMA. 2012;307(13):1414-1419. 8. 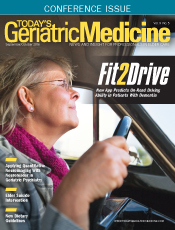 Hypoglycemia and hyperglycemia with fluroroquinolones. Med Lett Drugs Ther. 2003;45(1162):64.